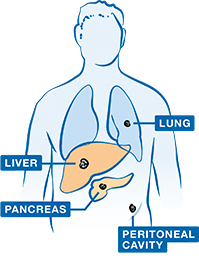 Most common places in the body where advanced pancreatic cancer may spread. Pancreatic cancer happens when abnormal cells in the pancreas grow out of control and form a tumor (TOO-mer). A tumor is an abnormal mass of tissue. When the cancer spreads from the pancreas to other parts of the body it is called advanced pancreatic cancer. This type of cancer is also known as metastatic (met-tuh-STA-tik) or stage 4 pancreatic cancer. How many people have advanced pancreatic cancer? If you have advanced pancreatic cancer, you are not alone. Nearly 26,000 people in the United States are diagnosed each year with this type of cancer. Are some people more at risk for pancreatic cancer? There are certain factors that affect a person’s chance of getting pancreatic cancer. It is important to know that having 1 or more risk factors does not mean that you will definitely get pancreatic cancer. And some people may get this type of cancer even if they don’t have any risk factors. Pancreatic cancer is more common in older adults than younger people. The average age at diagnosis is 71 years old. Men are more likely than women to get pancreatic cancer. Pancreatic cancer is more common in African Americans than in other races. People with a family history of pancreatic cancer may be at more risk of getting it. People with certain other conditions tend to have a greater risk for pancreatic cancer. These conditions include diabetes, chronic inflammation of the pancreas (pancreatitis), cirrhosis of the liver, and stomach problems. In addition to a person’s age, gender, race, and family history—all things that can’t be changed—there are risk factors for pancreatic cancer that are considered lifestyle factors. This means that they can be controlled to some degree. Smoking is one of the biggest risk factors for pancreatic cancer. A person who smokes is twice as likely to get this type of cancer as someone who has never smoked. This is true of cigarette, cigar, and pipe smoking as well as smokeless tobacco. Being overweight or obese puts you at a higher risk for getting pancreatic cancer. Being exposed to certain chemicals on a regular basis—like at work—puts you at greater risk for getting pancreatic cancer. These include certain pesticides, dyes, and chemicals used to refine metal. What is important to know about diet and nutrition? Eating can become challenging when you are living with pancreatic cancer. Developing a healthy eating plan—with the help of your doctor or nutritionist—is important and may help you to better manage your symptoms. What are some tips for improving my appetite? 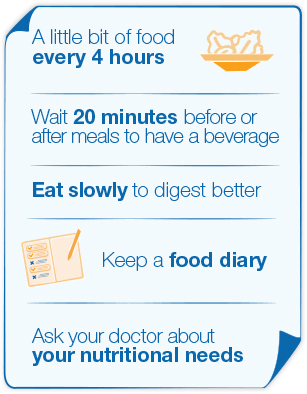 If your appetite remains low, or you start or continue to lose weight, be sure to talk to your doctor. He or she may prescribe medicine to help boost your appetite. This information is for educational purposes only. It is not meant to replace the advice of a healthcare provider. 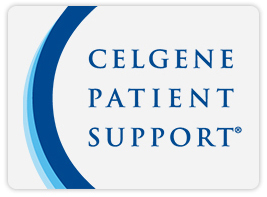 Always consult with a doctor or other healthcare provider regarding your or your loved one’s medical needs. For more information and tips on pancreatic cancer and nutrition, visit the Pancreatic Cancer Action Network (PanCAN®) website at www.pancan.org. ABRAXANE is a prescription medicine used to treat advanced pancreatic cancer, when used in combination with gemcitabine (jem-CY-tuh-been), as the first medicine you receive for advanced pancreatic cancer. ABRAXANE is a chemotherapy (KEE-moh-THAYR-uh-pee). Chemotherapy is a type of medicine that is used to keep cancer cells from growing or to kill cancer cells. Treatment with ABRAXANE and gemcitabine may help control or slow the spread of cancer cells. Your doctor may recommend treatment with ABRAXANE + gemcitabine based on the stage of your cancer and your overall health. Only your doctor can help you decide if ABRAXANE + gemcitabine is right for you. The medicine in ABRAXANE, paclitaxel, is bound to albumin. ABRAXANE is a different formulation of the cancer-fighting medicine paclitaxel (PAK-li-TAK-sel). ABRAXANE is made by binding paclitaxel to albumin (al-BYOO-min). 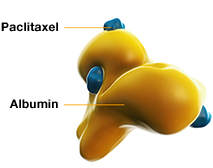 Albumin is a protein found in the blood. It is important to know that allergic reactions can occur with ABRAXANE. Premedication may be needed if you have had an allergic reaction. Allergic reactions may be severe and can lead to death. In case of severe allergic reaction, ABRAXANE should not be used again. 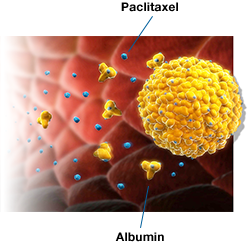 ABRAXANE travels through the bloodstream to reach cells in many parts of the body, including cancer cells. ABRAXANE may help stop cancer cells from dividing and making new cells. ABRAXANE works by blocking the action of proteins called microtubules (MY-kroh-TOO-byools). These proteins help cells divide. Systemic (sis-TEH-mik) treatments like ABRAXANE are used to treat metastatic (meh-tuh-STA-tik) cancer. This is cancer that has spread from one part of the body to another. It is also known as advanced or stage 4 cancer. Systemic treatments travel through the bloodstream. This makes it possible to reach cells in many parts of the body, including cancer cells. ABRAXANE may also affect normal cells. This may cause side effects. ABRAXANE travels through the bloodstream to reach cells in many parts of the body, including cancer cells. Illustrative purposes only. A nurse inserts a thin, soft tube into your vein to give the medicine. This is often called an IV. Treatment with ABRAXANE can cause irritation where the medicine is injected (injection site reactions). You should be monitored by your doctor or nurse during and after you receive ABRAXANE to make sure no problems occur at the injection site. In some cases, these problems occurred 7 to 10 days after the medicine was injected. Your treatment with ABRAXANE + gemcitabine will be given in your doctor’s office, at a hospital, or at an infusion center. Each infusion of ABRAXANE takes 30-40 minutes. Gemcitabine infusion also takes about 30-40 minutes. Tests, checkups, or waiting time may affect the length of treatment sessions. ABRAXANE is given once a week for 3 weeks in a row, on days 1, 8, and 15. 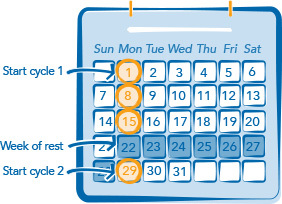 Your doctor will decide how many cycles you will get. 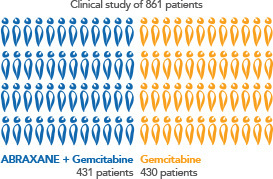 ABRAXANE + gemcitabine was given to 431 patients, and 430 patients received only gemcitabine. Both groups of patients were given these medicines as their first treatment for advanced pancreatic cancer. 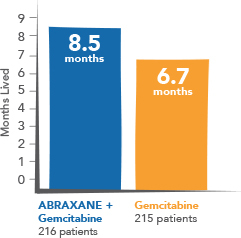 ABRAXANE + gemcitabine helped some patients live longer. A standard way of assessing cancer treatments in a clinical study is to measure how long the patients in each group live.